Given the Eagles had already clinched the second seed in the upcoming playoffs, the Eagles (4-1) matchup with the Special Forces (2-3) had “trap game” written all over it. With their incredible win over the Cardinals last weekend, the birds in black had already asserted themselves as a force to be reckoned with in the postseason. This game was about pride and focus and momentum. On their first touchdown drive the Eagles methodically moved the ball down the field as the offensive line blew the Special Forces off the line of scrimmage. Dakota Neer and Danny Kittner took turns gashing their way down the field behind some great blocking by the offensive line. The Eagles drew first blood as Kittner bounced one to the outside and raced into the endzone to put the Eagles on the board. Reed Erwin plowed his way into the endzone for the extra point to put the Eagles up 7-0. On the next possession, the Eagles defense took the field and continued to dominate as it has all season. The Special Forces tested the edges on the Eagles, but their efforts were fruitless as the Eagles played with discipline and a nasty disposition. Having failed to move the ball on the edges, the Special Forces tried their luck up the gut. 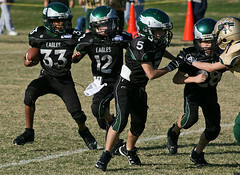 The Eagles defense proved up to the task as the Special Forces running back was swarmed then stripped of the ball. Wyatt “Ball Hawk” Harris jumped on the loose ball to regain possession for the Eagles. The Eagles offense took the field looking to take advantage of the Special Forces miscue. Having been burned by the Eagles on sweeps to the outside during the first quarter, the Special Forces defense made some adjustments and stacked the edges. It worked for a couple of plays until Coach Gene recognized the adustment and dialed up Dakota Neer’s number on an inside running play. Neer burst through the line of scrimmage and zig-zagged his way down the field on a spectacular touchdown run to put the Eagles up 13-0 early in the second quarter (PAT was no good). On their next possession, the Special Forces were once again overmatched by the Eagles swarming defense. The boys played disciplined football as they contained the running backs and forced them into the teeth of the Eagles defense. It was a clinic folks and the Special Forces looked anything but “special” as the Eagles D forced a punt with 2 minutes remaining in the first half. The Eagles regained possession with good field position looking to extend their lead before halftime. Danny Kittner did just that scoring his second touchdown of the half with a fantastic run behind the Eagles offensive line. Keanu Lopez busted through to the endzone on the extra point to extend the Eagles lead to 20-0. The Eagles could have coasted at this point as the game was well in hand, but the Eagles were hungry for more. Desperately looking to score, the Special Forces went to devised an aerial attack in an attempt to catch the Eagles off guard. Apparently they didn’t get the memo that the Eagles sport a ball hawk by the name of Wyatt Harris who stepped in front of an errant pass and plucked his 3rd interception of the season. With the pick, the Eagles regained possession at their own 10 yard line. On the very next play, Javin Wright took a handoff up the middle and outraced the Special Forces defenders on a 90 yard dagger that seemed to drain whatever fight remained in the Special Forces. It was Javin’s second TD in as many games and he’s really become a major threat with the ball in his hands. The kid can flat out fly and he’s a relative unknown quantity to some of the teams the Eagles faced earlier in the season. As such… we shall call him “Weapon X”. With the score, the Eagles extended their lead to 33-0 just prior to the end of the 3rd quarter. Having already scored twice, Dakota took a pitch from Reed Erwin, broke a couple of tackles and flew down the field for the Eagles second 90 yard touchdown run of the day. With the score, the Eagles led 39-6. After stuffing the Special Forces next possession, Coach Gene called running plays for some of the boys that don’t normally have a chance to run the ball. Tyler Magee had a great run for 9 yards and several of the other younger players had a chance to tote the rock as the clock wound down. Then, on a broken play, Reed Erwin raced around the end and down the far sideline on a 50 yard run. Reed was stopped just short of the endzone, but it was a heck of a run. Mercifully the whistle blew signaling the end of the game before the Eagles punched in yet another score. With their fifth consecutive win, the Eagles moved to 5-1 on the season and open the playoffs next Saturday at Queen Creek Middle School against the 7th seeded Rams (1-5). The Eagles handled the Rams 20-6 earlier this season, but the Rams have been playing much better ball of late. This should be a tough test for the kids as rumor has it that the Rams have been bringing a few players down from their Jr. Pee Wee team to help them compete. GO EAGLES! !